[156 Pages Report] The remote asset management market is estimated to grow from USD 8.82 billion in 2016 to USD 26.99 billion by 2021, at a Compound Annual Growth Rate (CAGR) of 25.1%. The remote asset management market ecosystem include technology vendors such as AT&T Inc. (Texas, U.S.), Cisco Systems, Inc. (California, U.S.), Hitachi, Ltd. (Tokyo, Japan), Infosys Limited (Karnataka, India), IBM Corporation (New York, U.S.), PTC Inc. (Massachusetts, U.S.), Rockwell Automation, Inc. (Wisconsin, U.S.), SAP SE (Wall Dorf, Germany), Schneider Electric SE (Rueil-Malmaison, France), and Verizon Communications, Inc. (New York, U.S.) which provide numerous IT and non-IT components required for remote asset management. Remote asset management uses technologies such as Geographic Information System (GIS), Real-Time Location System (RTLS), and the Internet of Things (IoT) devices to monitor fixed and mobile assets and provide real-time data about asset location, performance, and condition. This helps in streamlining the processes for operations, repair, and maintenance of physical assets and establishing a two-way communication between the assets and central application. This leads to an increasing operational efficiency through predictive maintenance, which in turn, utilizes predictive analytics to ascertain the machine and equipment downtime. 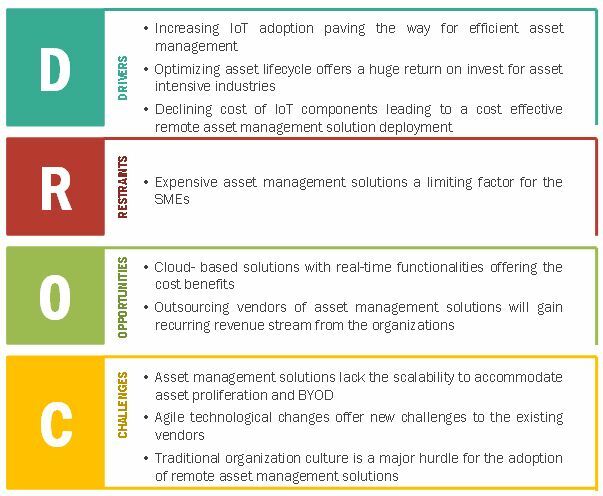 The major drivers for the upsurge in demand for the remote asset management solutions include declining cost of IoT components leading to a cost-effective remote asset management solution deployment, optimizing asset lifecycle offering a huge ROI (Return on Investment) for asset sensitive industries, and increasing adoption IoT technology and services. According to the findings published by the World of Sciences Journal, the maintenance and repair costs in different industries constitute a major part of the total cost due to machine downtime. With a predictive maintenance schedule, the manufacturing industry can save up to 50% on maintenance costs and 55% on unforeseen accidents and problems. Apart from this, there can be a possible reduction of 60% in repair time and 30% rise in the average time between two failures. Therefore, most organizations are considering the adoption of IoT for continuous asset monitoring, real-time communication, connected logistics, along with improved security and reliability. Asset management solutions are normally cost intensive and require huge one-time investment. The emergence of cloud technology has enabled the vendors to offer an economical solution which can be targeted to the customers focusing on price instead of complete features of the solution. SMEs are the best target audience for the cloud-based solution. The Software as a Service (SaaS) model is the best fit for these customers where SMEs will pay a subscription fee to use the remote asset management solution over the internet. The organizations whose overall performance rely upon their asset performance but lack an IT infrastructure or expertise to manage their assets tend to outsource the entire asset management process to the outsourcing vendors. The outsourcing process offers recurring revenue for the provider, as asset proliferation and implementation of new technology will result in an increase in the cost. The remote asset management market size is expected to grow from USD 8.82 Billion in 2016 to USD 26.99 Billion by 2021, at a Compound Annual Growth Rate (CAGR) of 25.1%. The major drivers for the upsurge in demand for the market include declining cost of IoT components leading to a cost-effective remote asset management solution deployment, optimizing asset lifecycle offering a huge ROI (Return on Investment) for asset sensitive industries, and increasing adoption IoT technology and services. The scope of this report covers the remote asset management market analysis by components (solution, platform, and service), applications, and regions. The surveillance and security solution segment is expected to grow at the highest CAGR during the forecast period. With remote surveillance and security solutions, assets can be accessed remotely via smart phone or tablet and integrated with security systems such as alarm and closed-circuit video cameras which enables the responsible personnel for actionable response. The predictive maintenance solution segment is expected to have the largest market share during the forecast period in remote asset management market. The predictive maintenance solutions are capable of accessing multiple data sources in real time. It aids in predicting asset failure or quality issues which reduce the unplanned downtime and maintenance costs. Predictive maintenance is more beneficial than routine-based preventive maintenance as in the former solution, maintenance is provided when required whereas in latter solution there is an unnecessary wastage of money and time involved. The connected logistics and fleet management is expected to have the largest market share in 2016 and estimated to grow at the significant CAGR during the forecast period in remote asset management market. Connected logistics and fleet management is all about integrating advanced technologies with the existing transportation and logistics infrastructure, delivering real-time online information about reminder & alerts for vehicle maintenance, driver’s live performance and feedback, fleet/vehicle status (moving/stopped/idle), engine status, engine diagnostics, delivery status, delay status, and others. Asset tracking, monitoring, and management would help supply chain managers to locate, check status, fleet data, routing, scheduling, driver behavior, diagnostic, and others. As per the geographic analysis, North America is likely to benefit from its technological advancements followed by robust internet infrastructure, widespread adoption of new technology, and the presence of strong domestic solution providers. This all have contributed towards the shift to smart infrastructure from conventional infrastructure. The need for better operational efficiency and business process at a low operating cost is expected to drive continuous growth in the remote asset management market. The growth of remote asset management market depends on the factors, such as increasing IoT adoption, growing need for optimization of asset lifecycle, and decreasing cost of IoT sensors. Various established players and new entrants in the industry are offering remote asset management solutions to meet the varying needs of the Global Industry. Effective logistics and fleet management relies on collaboration and communication with the help of advanced technologies. Asset tracking, monitoring, and management would help supply chain managers to locate, check status, fleet data, routing, scheduling, driver behavior, diagnostic, and others. Various companies have started adopting remote asset management solutions to offer more robust logistics and fleet services. Remote asset management features such as reminder & alerts for vehicle maintenance, driver’s live performance and feedback, fleet/vehicle status (moving/stopped/idle), engine status, engine diagnostics, delivery status, delay status, and others. These attributes make logistics and fleet management application more optimum and revenue generating. The Building Automation System (BAS) keeps building temperature within a definite range; observe device performance and fiascos in all systems light rooms according to the occupancy status, and offer breakdown alarms. Automation systems help reduce energy used in building and maintenance with respect to a non-automated building. However, the asset tracking and monitoring for BAS would present the historical trending and real-time data, letting facility supervisors to effortlessly manage and monitor both their buildings’ automation systems and buildings asset status. The remote monitoring for BAS would allow operators to get intuitive information about asset performance, status and breakdown, facilitating smarter decisions for asset, and BAS and energy management. Building automation and asset tracking & management solutions create seamless efforts of both the solutions to offer control over building operations, reduced utility costs, meeting the end-users’ need, enhanced efficiency, enhanced asset lifecycle, energy usage, and increased response time in emergency situations. In addition to that, cost savings can be achieved through the streamlined processes for building and facility management with integrated asset monitoring and tracking and BAS. With the technological advancements of Industry 4.0 and smart factories, manufacturers are in the verge of adopting advanced technologies to improvise their production processes with IoT as well as smart manufacturing concepts. Furthermore, asset monitoring and tracking is presently implemented by manufacturers for tracking and monitoring asset location and status. Under plant asset management, sophisticated monitoring technology would leverage advanced features to avoid asset failure and to significantly enhance asset performance. Retail outlets, chains and stores need to uphold an organized and clean space to offer customers with an enjoyable buying environment. Furthermore, with shrinking operational budgets and increasing equipment maintenance and repair costs– steadily up to 2% of revenue conferred by Food Marketing Institute, remote asset management would capture the smart retail application market in coming years. The remote asset management solutions would offer innovative ways to get the most out of retail space’s assets, maximize uptime and plan for unanticipated disasters to keep maintenance costs under control. Remote asset management solutions for retail space would be utilized to provide a continuous stream of data for measuring energy usage and counting fault and error codes. In addition to that, assets such as refrigeration equipment, lighting, gas pumps, and HVAC systems have intellect embedded into them. For utilities and smart grid industries, it has become vital to manage their investments in Internet-aided smart utilities assets, and the network substructure that associates customers to the power grid. To achieve the same, remote asset, tracking, monitoring and management facilitate utilities to optimize the cost of operations and enhance the customer experience. Remote asset management solutions support utilities expand their operational competence, offer consistent service and diminish energy costs to end consumers. The remote asset management in utilities and smart grids advances their capability to leverage their assets. Utilities majorly have numerous network setup centers with different procedures, tools, and methods, where asset monitoring supports make available the platform where these variances can be evaluated. This is vital due to the increasing demand for high operational performance from various constituencies. Healthcare and wellness services have come to comprehend the significance of asset management, its industry-wide impact and interdependence with operational activities, staff productivity, lifecycle costs, asset performance and management. Furthermore, with the average percentage for equipment and asset consumption at around 30%-40%, asset management has turned out to be a possible area of development that can be attained with quantifiable outcomes. The remote asset management solution vendors offer healthcare providers a comprehensive solution, which assists hospitals & wellness centers in optimizing service excellence, reducing the threat of non-compliance, and functional costs. Agriculture is one of the significant applications for the adoption of remote asset management. The remote asset management for connected agriculture allows farmers to keep track of farm’s overall health, along with its chances of failure and also suggests if there is a need of maintenance. Agricultural asset tracking, monitoring, and management includes attributes such as use of devices including sensors, drones, and irrigation systems, gathering data from various devices deployed at farms, real-time monitoring of the farm with fixed camera for real-time images of the crops and details of crop health and others. Other application areas of remote asset management include environment and sustainability, education, and security. Remote asset management for environment and sustainability caters to asset monitoring for waste management, water management, and carbon emission application from smart cities and smart building facilities. Furthermore, remote asset management solutions for education help to track and monitor the location of valuable educational resources audio/video equipment, furniture, laptops/tablets, and IT assets and documents using barcode scanning and schedule asset maintenance. Security application would use remote asset management solutions for tracking and monitoring commercial/industrial complexes, apartments, residential areas, assets in hospitals, malls, warehouses, and other public places. 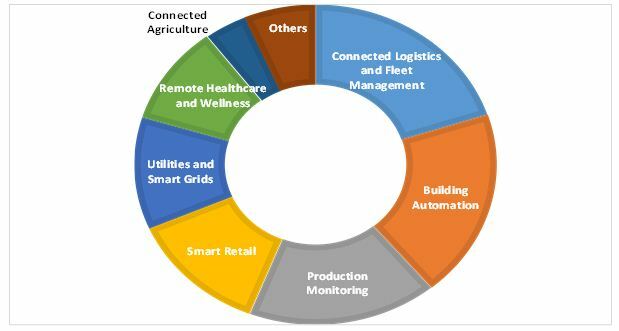 What new opportunities are generated through declining cost of IoT sensors? Which are the top use cases where remote asset management solutions can be implemented for revenue generation through IoT and cloud services? What potential opportunities have augmented due to increased outsourcing, and how are managed service providers getting benefitted from it? What should be your go-to-market strategy to expand the reach into developing countries across APAC, MEA, and Latin America in Remote Asset Management Market?